Gelatine, collagen peptides and the pure by-products that are generated during their manufacture such as fats, proteins and minerals (FPM) play a crucial role in the preparation of highly nutritious animal feeds. FPM products are in especially high demand in the animal feed industry because pure fats are excellent sources of energy. Moreover, these ingredients are very pure and highly nutritious and are thus well suited for animal feeds. Gelatine is primarily added to animal feed for its hydrophilic properties. Its jelly-like consistency holds feed together, making it transportable and extending its shelf life. When animal feed is enriched with vitamins, the gelatine coating also protects these from light and oxygen. A positive side effect: adding gelatine to feed ensures that the fur of our four-legged friends remains wonderfully glossy. Protein makes the feed especially easy to digest and ensures that it is well tolerated by the body. 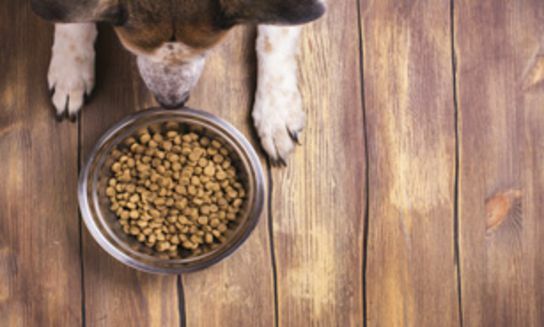 However, for those who mix their own animal feeds, there is no need to forgo on those properties of collagen peptides that are beneficial to pet health. Collagen peptides are also available as a nutritional supplement in the form of special animal capsules. These special peptides are resorbed well by the animals, and they help to prevent arthritis or the preliminary stages of osteoporosis. Optimal care and handling have ensured that our pets live much longer, but this has made these age-related ailments not only common in humans, but also in animals. With proper nutrition and care, however, every animal can remain agile and free of pain to a very old age. Collagen peptides play an essential role in this. Adding collagen peptides to feed is not only beneficial in old age, however. Veterinarians also recommend that they be given to puppies as a prophylaxis to keep their skeletons resilient and flexible. This is also common practice in equestrian sports: breeders of valuable racehorses feed foals highly nutritious peptides from birth to promote bone development as they grow. Collagen peptides are also given to adult animals with their regular feed to fortify and stabilise their stressed joints. After all, just as in cats and dogs, gelatine also helps prevent age-related ailments and build up cartilage in horses – thus ensuring that the bond of friendship between human and animal will last all through a long and healthy animal life.